Outstanding product. Truly is a relief knowing that I have found such an honest and reliable company to purchase from. 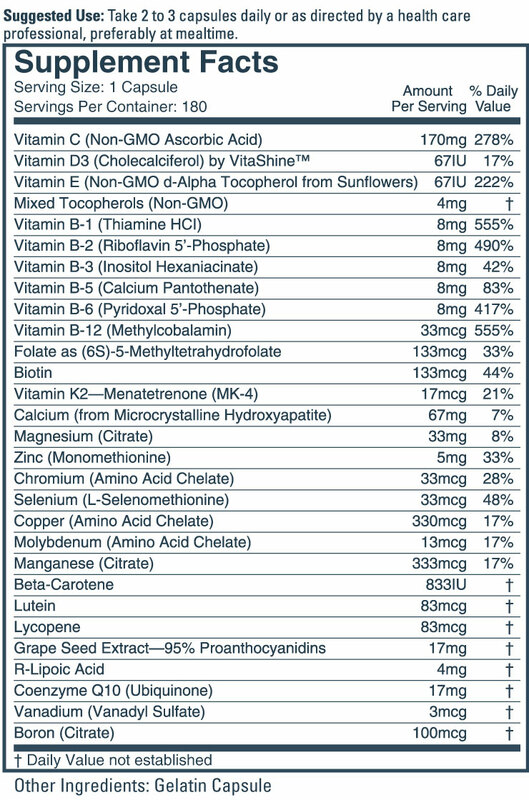 No deceptive marketing or any unnecessary additives like seemingly EVERY other company's multi-vitamin that I have ever found has had. You are getting a straight-forward, quality product here, something that should not be difficult or stressful to find! But I am very happy now thank you Dr. Ron!!!! The best multivitamin on the market, and an excellent prenatal too! My husband and I and our older children have been taking this vitamin for years! (We are both 55 years old.) It has important and crucial elements not found in other vitamins, and when you do find them, there are also undesirable things like magnesium stearate in them too. We generally take 2 - 3 capsules a day, 5 days a week. We have no serious health problems and don't take prescription drugs, and I owe this to the blessing of God, but in trying to take good care of our physical bodies, I am so thankful to have the Doc's Best multivitamin. I love that you can take 1 to 6 a day, depending on your health and your needs. I think it is a crucial part of maintaining underlying good health, in this day of so many stressors, environmental pollutants, chemicals and excitotixins, etc. I also took 4 capsules a day during my 9th pregnancy 9 years ago, when I was 46. I had a healthy pregnancy and a vibrant and healthy baby! This multi-vitamin, combined with the Cal 1000-Mag 500 supplement, ensured my and my baby's bones stayed strong and healthy as well, and also during the breastfeeding years. Now my oldest daughter is expecting her first baby, and she is taking this supplement as well! Doc's Best is the best! price - but you get what you pay for! My husband and I started taking Doc's best a few months ago, starting with 1-2 capsules daily. After taking only 1 capsule daily my husband started commenting about how much stronger he felt during his morning bicycle rides (he's an outdoor cyclist and rides about 100 miles a week). He started taking 2 capsules and noticed even more improvement. He's now taking 3 capsules daily and can't believe how much more strength he feels during a ride. He doesn't feel tired like before when his heart rate goes way up while climbing the big hills. By the way, he is 78-1/2 years old! Thank you for this excellent product.